Home › Others › Archive by Category "Tools"
KineticWing is a free IDE that is lightweight, portable and works on all major operating systems (Mac support is mentioned to be coming soon). 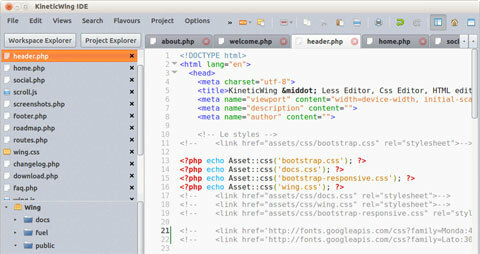 It is not a complicated IDE but more like a smart text editor with modern features. Often we think of using some class or id within a CSS but later on decide not to use them finally. But several times we forget to delete those classes from the CSS file. This may not be a problem for sites where the use of CSS is very less. But this may be accountable for much junk lines within your CSS which are unnecessary and unwanted. Many times it happens that we use more than one CSS files for a site or application and copy many unused classes or ids. This way the amount of code loaded every time becomes a much considerable value. These unwanted CSS selectors should be deleted from the CSS files. To delete those unused CSS selectors you first need to identify them. Last days Twitter is popular and lots of people use it. There are people that build tools to enable and simplify functionality and help make a service like Twitter even better. Here are some of these tools that will help you do more with Twitter. CSS3 getting more and more popularity in more and more websites. However, there are still those out there that are holding out on learning it and using it. This is probably due to the fact that it’s not fully supported yet in all browsers. Nevertheless, if you’re one of those that haven’t started using CSS3 or you’re a CSS3 pro just looking to speed up your work flow, here are six CSS3 tools that you should find useful.